Half-Press for focus still not available on Sony?? Hi, i am wondering if the option to half-press the record button on the Ronin-S to aquire a focus point, will ever be available on the Sony mirrorless range? The perfect scenario would be, the ability to half-press the record button to aquire a focus point, then hit record knowing that its not automatically going to search for a focus point when i move. Good luck with your Sony. Hi Spruce_Moose, half-pressing the Camera Control Button to autofocus is available for many Sony series cameras. By focusing when you move, do you mean the follow focus function? If yes, it is not available for Sony. At present, the Focus Motor has been released, and it can be used to control the focus and zoom function of the camera. Please correct me if I understand incorrectly. Thank you. Hi Mindy, the camera is already automatically focusing so i don&apos;t understand what the use of the half-press to focus button? Currently this button only works in AFC, will this button ever be able to work while in MF mode on sony cameras? 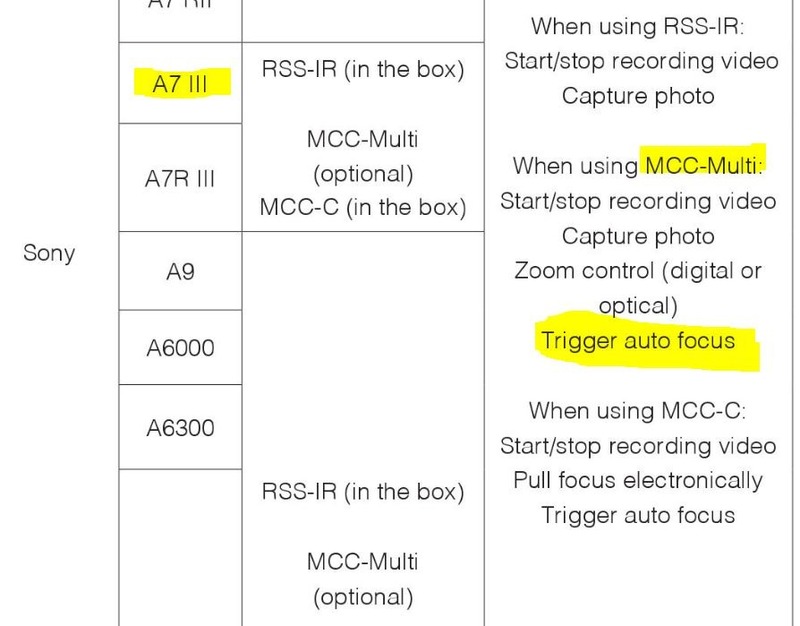 I can confirm: A7iii/MMC &apos;Trigger Auto Focus&apos; function is in fact: &apos;not working&apos;. I have reported this a few times already...It used to be working a few firmwares ago..
Hi AVsupport, manual focus refers to the focus mode by turning the lens focus ring or by pressing the direction button to get a clear focus. The principle of controlling the camera&apos;s focus via Ronin-S and half-pressing the camera shutter for autofocus is the same. The manual focus mode cannot trigger the camera&apos;s autofocus function with Multi cable, sorry for the inconvenience caused. Hi Spruce-Moose, manual focus refers to the focus mode by turning the lens focus ring or by pressing the direction button to get a clear focus. The principle of controlling the camera&apos;s focus via Ronin-S and half-pressing the camera shutter for autofocus is the same. The manual focus mode cannot trigger the camera&apos;s autofocus function with Multi cable, sorry for the inconvenience caused. Sorry Mindy, but this is not working in AF-C mode, as indicated. Not manual focus, of course not. The half-press on gimbal-record button should act like the half-press shutter button on the camera, and it doesn&apos;t. It did work, a little while ago, but we lost the functionality. Please reinvestigate the issue, without the misunderstanding. With my Sony a7rII, I operate my camera in Manual focus when filming and through an option known as back-button-focus and i am able to switch/hold between AFC and MF at the push of a button to acquire a point of focus. Im guessing the Ronin-S is limited to its capabilities with Sony and thus will never have this option? I&apos;m interested to know how/why you used the button to focus when it was actually working? My understanding is the half press to focus button only works when in AFC mode yet, when filming in AFC, the camera is already looking for a focus point so i don&apos;t understand what you would use the button for? Thanks for your feedback, I will report to engineers for further test and come back to you soon. That is not available in AF mode via the Ronin-S with Multi cable currently, sorry again for the inconvenience. Hi AVsupport, our engineers have tested that half-pressing the record button can trigger the Auto Focus in AF-C mode, we will need a short video for further verification, any chance to share with us? Does it happen after updating to the latest firmware? What lenses are you using? add: not having this issue with Sony A6300 & 18105f4. Also having this issue with A7iii & 18105f4. So this might be an A7iii thing ? Appreciate your time to take the video, we have forwarded to our engineers for further analysis, once there is any update, I will keep you updated. You are most welcome, I will follow it up and update to you as soon as possible. I can also confirm that the half-press isn&apos;t working properly anymore.